How do you like the headline of this story? "Every Spark-Ignited Internal Combustion Engine Ever Produced Has Been Damaged By Gasoline." It's a pretty damming statement, isn't it? Well, I'll be damned if it's not true. Every gasoline-powered internal combustion engine ever produced and put into service has been damaged by gasoline. What's more, every single diesel-powered internal combustion engine ever produced and put into service has been damaged by petroleum diesel fuel. Of course, it's really no big deal; the inherent nature of the internal combustion engine is that it will be damaged after it's put to use. Gasoline and diesel fuel are corrosive, they leave behind filthy deposits that turn to clogging goo, and the igniting of gasoline and diesel in the engine cylinders create thousands of explosions during every minute of operation...so how could every single gasoline or diesel-powered engine put to use not be damaged? So if this is such a no-brainer, such an obvious statement of...the obvious, you may be asking yourself why I even sat down to write this story? Here's why: A short while ago, I was directed by one of our readers to a message posted on the Facebook page for a group called American Energy Alliance. The post stated, "As I handed it (my car/engine) over, I asked the mechanic how many of the engines he works on have been damaged by ethanol. His reply: All of them." As far as I could tell, the quote was not attributed to any specific person, and it provided no other details related to the situation that the quote refers to. It's not important if the situation was true or not because it is typical of the overly exaggerated, puerile, ignorant claims made by the oil industry against ethanol. However, the quote was linked to a story written by Jared Meyers, a fellow at the Manhattan Institute for the Criminally Insane (just joking, that's a reference to Mel Brook's "Blazing Saddles")...he's a fellow at the Manhattan Institute for Policy Research. The story was originally published on Forbes.org, and is titled "Politicians Love Burning Food For Fuel." It supposedly details a conversation of some sort that took place between Mr. Meyers and Robert Bryce, a fellow fellow at the Manhattan Institute for the Criminally Insane (sorry, I couldn't help myself - whenever I hear or read "Institute for..." it makes me think of Mel Brooks). Robert Bryce is a fellow fellow at the Manhattan Institute, a senior fellow, at that! Robert Bryce has been spewing his anti-ethanol nonsense for years. In 2013, I wrote a 60+ page rebuttal to his cesspool work "Gusher Of Lies." I use the word cesspool instead of seminal because the book stinks like a filled cesspool. You can read Mr. Meyers' Forbes story by CLICKING HERE, and you can read my rebuttal to Bryce's book by CLICKING HERE. I've given Mr. Bryce numerous opportunities to challenge my rebuttal or to recant or update some of his stale claims from a decade ago with corrected information but he has chosen to not do so. 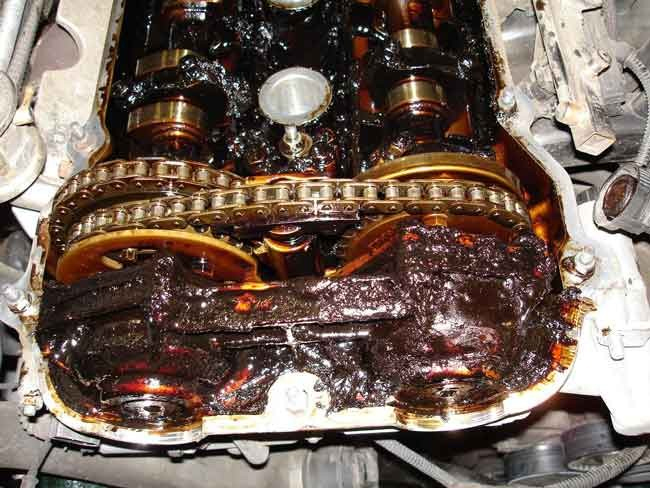 Sludge, gunk, goo, crap - it's caused by gasoline. As for the author of this article, Jared Meyers, I'm bewildered why anyone would title an article with a patently false statement, except as a joke or as sarcasm (as I did with my headline of this editorial). But in reading the article I find no evidence of intended humor or sarcasm. There is only stupidity; the kind of stupidity that matches the empty claim made about ethanol damaging every engine that the fictitious mechanic ever encountered. By the way, for those with a scorecard, this is not the first absurd anti-ethanol editorial published by Forbes. This past April they published a work of junk written by Steven Salzberg, titled "Why Are We Growing Corn To Fuel Our Cars? Three Reasons Why Ethanol Is A Bad Idea." Mr. Salzberg is supposed to be a distinguished professor. Based upon the nonsense he wrote about ethanol he must be looking to be an extinguished professor by committing integrity-suicide. If you have the opportunity to visit the Forbes website and read this editorial you will undoubtedly come across my multiple comments after reading Salzberg's fairytale. I was my usual delightful self, of course. The upshot of what I'm getting at is that it's an absolutely asinine thing for the oil industry and its whores to blame ethanol for causing the same problems that gasoline causes, with even greater regularity and more severe consequences. Engine problems did not suddenly occur with the advent of E10. The automobile profession and automobile repair shops didn't suddenly spring up in the past two decades. Gasoline has been damaging engines for as long as gasoline has existed. The alarming aspect of this is that there are too many mechanics out there who don't know this; they think that gasoline is a magical elixir of engine health and vitality. Now, allow me to turn my attention to this American Energy Alliance thing. This group like several others is nothing more than a disingenuous decoy for the oil industry. Similar to American Council For Capital Formation, AEA is a shill for the oil industry. In AEA's "about us" page they state that they have no ties to any political party, and it has no interest in supporting the agenda of any particular political party. The presumption is that they favor what's right for America and Americans in total. I say it's code for "AEA wants to screw all of America and all Americans, regardless of race, color, creed, religion, or political party." They want what's right for OPEC, foreign oil dictators, terrorists, and un-American American businessmen. To AEA, ACCF and all these others, I ask, if gasoline is so good and so harmless to engines and humans and the environment and our economy then why do you need to rely on ridiculous lies and gross over-exaggerations to condemn ethanol? SEE ALSO: Why Do Small Engines Suffer From Ethanol Problems? 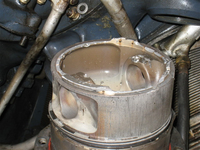 http://www.theautochannel.com/news/2015/09/01/140446-why-do-small-engines-suffer-from-ethanol-problems-video.html. Marc, I have no intention to enter into debates with you on the numerous anti - oil & gas articles you have posted here on this forum. Have at it, knock yourself out hyperventilating about the evils of oil & gas on the Oil Price Forum. You have an uphill battle, best of luck in your opposition. As far as your amusingly crafted clickbait article title above, perhaps I could offer you an analogy of the simple fact that both water and oxygen are necessary for life to exist here in Earth. Yet water and oxygen will corrode iron and steel. That doesn't make water and oxygen "bad". Tom, you are exactly and positively correct, and that of course is the point of the article; it's to show that the excessive blame placed on ethanol is virtually no worse than the two most crucial things to life on Planet Earth. When I present this topic at a speaking forum I always say that as corrosive as water is we choose to wash babies in it, and you know how delicate they are. In fact, it can take 70 to 90 years before we see the effect caused on babies by the water corrosion - they get all wrinkled and their skin become rough and crusty. It's a pleasure to have an astute person like yourself on my side. Marc I'm terrible sorry to disagree with you, but gasoline is not the only contributing factor in damage to the internal combustion engine. Detroit has long known how to make parts better than when the general public receives in the products they buy. But, the same can be said of every product manufactured here in the United States. Pardon me while I go back to when our country was coming out of the Great Depression. While I never was able to read the paper first hand. A Ivy League professor wrote, and I'm paraphrasing here. "While we have the capability to manufacture goods which can last for a very long time. For a society to be prosperous it will be necessary that manufacturing not build products while can last a long substantial amount of time. An economy and society need goods and parts to wear out and be replaced if that society is to grow and prosper." Placing yourself back in the time frame of this professor. The end of the Great Depression.Who were just two of the major players of that time. Henry Ford and Thomas Edison. Do you really think Detroit or the Big Three, as they use to be refer to as, never had a clue on how to build an engine that not only would last longer, but run further on a tank of gas. Please! Back in the 70's when we were being held at bay by Arab countries who were producing oil. Which by the way we built and showed them how to refine crude oil. Which they had no idea they were sitting on top of. Every backyard mechanic and share tree engineer was trying to figure out how to make little Ford Pinto and Chevy Vega engine get better gas mileage. Then one guy stepped and said, "I have taken a production line car and will drive it from Detroit to central Florida on one tank of gas, non-stop except, for bathroom breaks. So the media circus began in Detroit. The day this guy took off for Florida crowds of people cheered him. All long his route people waved and cheered. All the way to his destination. At the end of his trip were some guys from General Motors to meet him. They congratulated him on his achievement and they were so impressed by what he had accomplished they wanted to buy the engine and the plans for $150,000.00, but he would have to sign all rights over to GM. In doing to the man received a huge check at the time and was very proud of his accomplishment. He had built and showed the world an engine could be built which would result in great gas mileage. Today that car, and it's engine is sitting in an unassumed building somewhere, perhaps in the Detroit, wrapped up in plastic and tape, perhaps in a large wooden box, maybe on a steel rack holding some other proto-type cars that will never ever see the light of day ever again. Just so no one thinks I'm just talking out my hat. I grew up in the suburbs on the west side of Detroit back during the 60's and 70's. I have family, and friends who not grew just like me, and had numerous family member and friends of the family working in the automobile industry. I was, as I like to put it. Spoon fed Henry Ford, Thomas A. Edison, and Dodge, Chevrolet. These were the family names I grew up learning about. Every year for the first six years of my education as children we were taken on field trip to Greenfield Village and the Henry Ford Museum. That location was the last part of the Ford Family Farm. The Ford Proving Grounds runs right in back of Mr. Ford's birth place. Also, I've been turning a wrench since I was 13 years old and began racing when I was 14 years old. Ethanol gas and the internal combustion engine, is a joke. Ethanol is nothing more than something made for tree huggers and politicians make people feel good about themselves and some body is doing something our environment and air pollution. That was told to me by an old oil man when I began my career in oil & gas. I am a Sr. Petroleum Landman, Sr. Right of Way Agent, Sr. Permitting Agent. I build drill site and roads. I conduct plug and abandonment operations, as well as Project Manage frac tank construction and site reclamation. I hold a Texas Real Estate license and my education is in journalism, finance, and a past member of toastmasters. 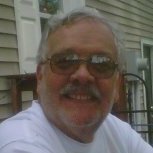 I have been a Sr. Land Professional for over 22 years now, I love my job and I love my industry. By the way Marc. The picture at the top is an aluminum head. Do you know the difference between an aluminum head and a steel head? Which do you think is more durable, aluminum or steel? Finally, what industry brought aluminum engines into the automobile industry and by whom? By the way Marc. That picture of the double overhead cam you blame gasoline for looking like it does. 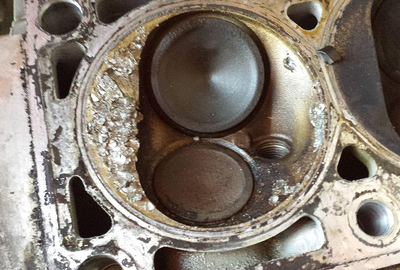 Actually, that part looks more like bad maintenance on the owners part, and not as a result of gas. 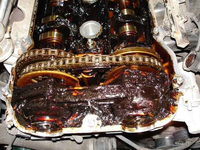 Sorry, without normal oil changes and regular engine maintenance any engine component will look like that, and actually putting that part in a engine cleaning tub and spraying it down with some good clean gasoline would do wonders to clean off a lot of that sludge. Of course the best way would be to power wash the entire component to get rid of all of that old sludge. Marc I was wondering. Do you work on your own car or do you take it to the dealership have someone there work on it for you? Jac, you don't have to be terribly sorry, or even regular sorry. Chances are that by the end of our correspondences one of us will learn something ( we both might learn something). If it's me, that's okay, everything I know came from "learning," not because I was born with some innate information. If you were "spoon fed" by Henry Ford, Thomas A. Edison, and Dodge, Chevrolet, that's great, particularly because Ford, Edison and the top scientists at Chevrolet (General Motors) all believed that ethanol was the best ICE fuel, and the fuel of the future. So if you say that ethanol and internal combustion engines are a joke then you're going against your "mentors." I do agree with you that there are many contributing factors in engines getting damaged; I never said it was the only factor. But regardless of what those other factors are, gasoline was one of the factors in every single instance. Of course, you have to understand that my headline wasn't just an insightful or challenging comment, it was also to poke fun at all the people who blame ethanol for every single problem...as I point out in my editorial. Meanwhile, if you also had the opportunity to read the piece that I link to at the bottom of the editorial, and review the different resource websites that are linked, you'll see that ethanol is at least as compatible with rubber, aluminum, and steel as gasoline and the different aromatics; and in some cases more compatible. In answer to your question about where and how I get my vehicles serviced, I learned a long time ago to never have a dealership service my vehicles, they are almost always the worst people to go to. Other than that, I don't have any single answer. It depends on the problem, on whether it's something that I can fix myself, and on the cost. What about you? Ethanol is about as renewable as it gets, so is natural gas. That makes it a superior fuel over gasoline when the price is the same or lower. Natural gas is better because the price is even lower but it is a problem for small vehicles due to the space taken up by the tanks.